Single Stage Digital Temperature Controller. -30°F to 220°F, 24VAC. 0-10V DC Output. The Ranco ETC is a micorprocessor based temperature controller suitable for switching 120Volts at up to 16Amps for heating or cooling applications making it suitable for a wide range of applications. This is a great universal controller for any application where switching 120Volts or temperatures outside that of a normal home thermostat is required. The sensor with an 8' foot cable and instructions are included with the unit. The Ranco ETC-112100 is identical to the Ranco ETC-112000 except that this unit also has a 0 to 10 Volt output that corresponds to the temperature reading. This can be used with external monitoring systems. Unsure which Ranco ETC Controller you need? Check out our ETC Selector. 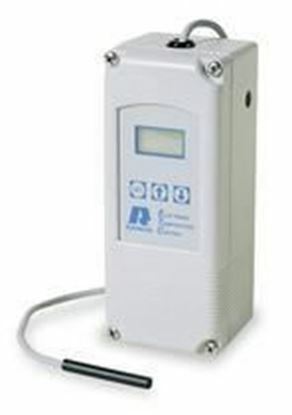 Single Stage Digital Temperature Controller. -30° to 220°F, 120/240VAC. 0-10V DC Output.